This elegant offshore cruiser offers an exceptional interior and deck plan designed by Vittorio Garroni with ease of handling in mind. Every detail has been conceived to offer the highest quality cruising experience.Welcome to a new style of contemporary interior that reflects a long nautical heritage. Rich materials are found throughout including leather, blond teak flooring and stainless steel. Sleek windows and skylights bathe the interior in light. Click the toggle below to learn more about Jeanneau. Three values that have stood the course of Jeanneau’s history. The Jeanneau experience is unique. Our mission: to allow everyone to discover the pleasures of the sea, and to experience in complete serenity those singular moments spent on the water. No other builder can offer the same level of cutting-edge design, superior finish, performance and customer satisfaction – all in a competitively priced package. 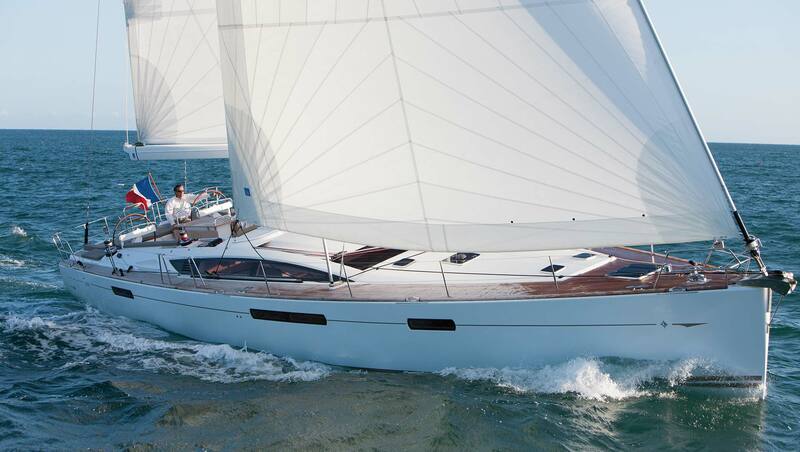 A reference among boatbuilders, Jeanneau is distinguished by the elegance of its boats. Their pure, modern lines are drawn by internationally renowned naval architects, who bring innovative ideas to each new project. This expertise, in combination with the experience of the Jeanneau project teams, produces attractive, comfortable boats that are always easy to handle. Jeanneau owns the largest production site for cruising boats in Europe, stretching over 40 hectares. Over a hundred specialized engineers and technicians work in the Jeanneau design offices at the heart of a technological centre. For Jeanneau, quality is an obsession. To acquire top-of-the-line materials and parts, Jeanneau selects the best suppliers, those who share Jeanneau’s commitment to quality and rigorous standards. The Jeanneau Formula for success: Combine almost 60 years of practical boat building savoir-faire with the latest construction technologies. Invest in and continuously improve technologically advanced factories with ergonomic production lines, computerized processes and efficient logistic supply chains. Translate the efficiencies into lower costs and higher quality for the customer. Our total quality control system tracks a product through the entire production process and beyond. From laboratory tests of each batch of resin to tank testing to customer satisfaction questionnaires and frequent supplier reviews, we continually seek ways to improve our boats. Become part of the JEANNEAU family! When you purchase a Jeanneau you become part of our family. At Jeanneau, we know that delivering excellent boats is only the beginning; excellent customer service must follow. Jeanneau has an established and professional distributor network in 80 countries. They are all experienced and receive regular training on Jeanneau products and new models. Distributors are aided by an innovative intranet program to facilitate the delivery of spare parts in the shortest time. In addition, each of these distributors is prepared to advise our clients and provide them with the exemplary service they should expect from a major boat builder.